It took a while, but I finally saved enough money to buy a decent telephoto lens (that didn't cost me a kidney) for wildlife and distant subjects. I bought it in the Summer, so the timing would be a good transition into the incoming bird migration during Fall, and Owls throughout the Winter/Spring. There's a few reasons behind wanting a telephoto: the first was to expand into a new area of photography, and the second was because my gear would be sitting around collecting dust without it. In this blog, I'll discuss a few points that have helped me find some birds of prey, as well as tips on how to photograph them. I'll also include some of my favorite images I've gotten so far this year, and will continually update this blog as more images come in from my hikes. Most of my pictures come from Southern Ontario because that's where I live. 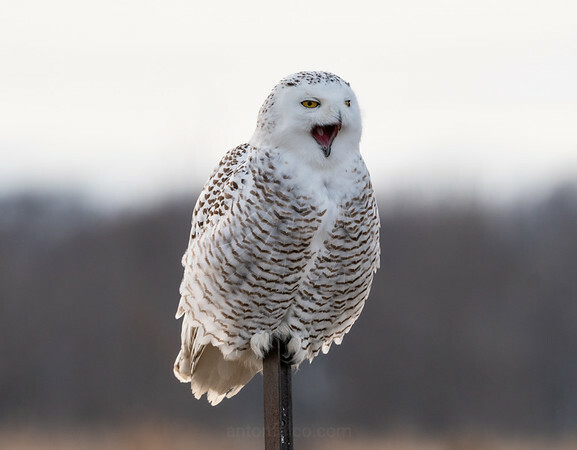 The general points I'll include will give you hints with regards on where to look (at least among the species that I've found), but because "birds of prey" is a general term that encompasses a very large amount of bird species; no general tips will include all species. Additionally, there's no guarantees that a specific bird species lives in your area. As an example, different Owl species can have dramatically different habitats despite living relatively close to each other. 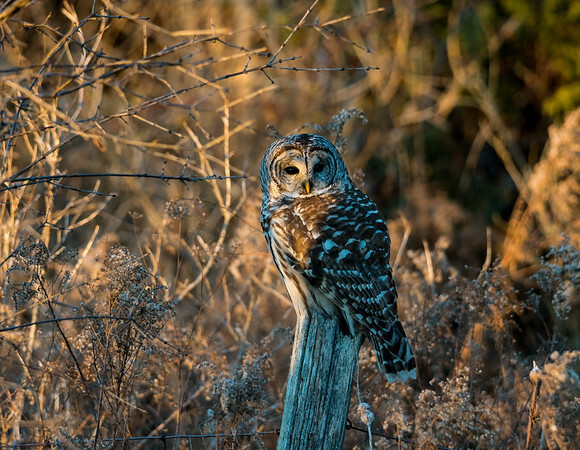 If that particular habitat isn't found in your area, the Owl may not be in the area either. 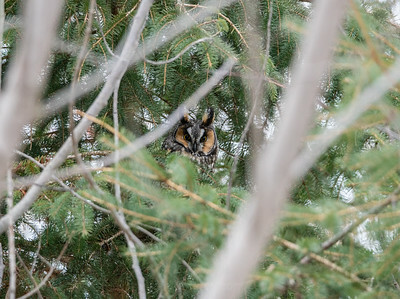 Before heading out, if you're looking for a specific species of Owl, for example, try to find field reports for your area that will tell you the types of birds that live in your area. You can also find books or web pages that give you breakdowns on the habitat and area that a specific bird will be expected to be found. This will, at least, give you an idea of what you should expect. 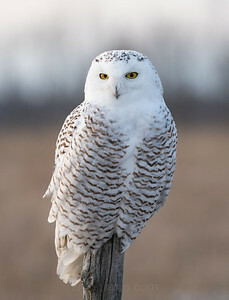 Most Owls are nocturnal (but not all, such as the Snowy Owl), meaning they hunt at night. This is a problem, of course, because even the most expensive cameras aren't great at night (especially at the shutter speeds required to capture moving Owls). So, how do you solve this issue? Go for your hikes early in the morning as the sun rises, or right as the sun begins setting. 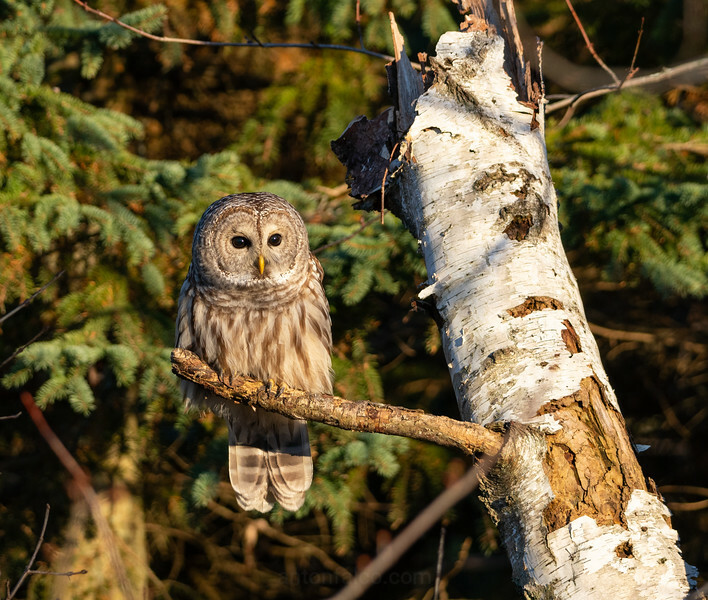 There's no guarantees on whether Owls will be active (some like going to bed early or sleeping in), but I've found many are at least awake around sunset. As stated before, field guides are extremely helpful here to find habitats and local areas that may attract birds of prey. You can also hike during the day and try to find them roosting in a tree. I've found this strategy to be more convenient for timing (instead of needing to hike near dark), but also more difficult. 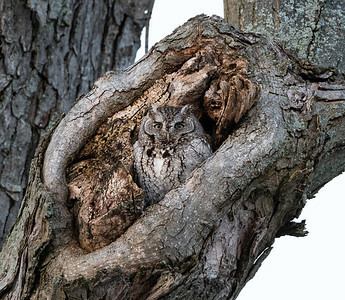 Owls don't want to be found, so they'll pick areas where they will be well camouflaged, or may roost inside hollow areas inside of trees, only to come out later in the day. 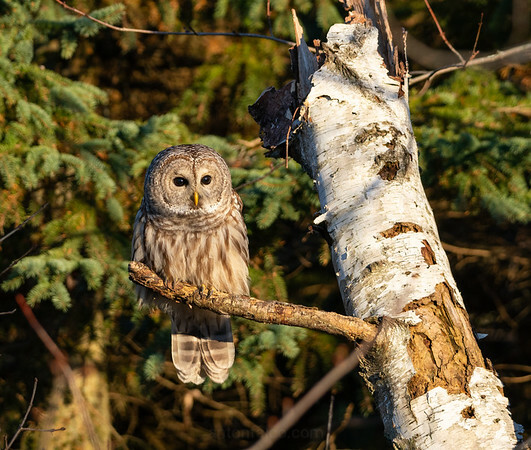 They tend to leave clues, such as droppings or white streaks along or underneath a tree that they frequent, so if you find those, an Owl may be further up in that tree, or a neighboring one. 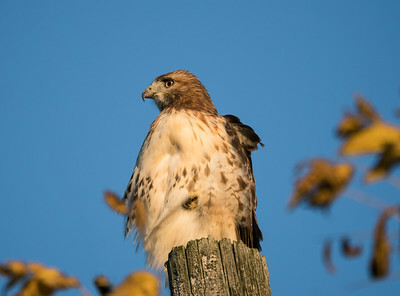 In contrast, many other birds of prey, such as Red Tailed Hawks, Eagles, Falcons, etc. are diurnal hunters; meaning they hunt and are active during the day. 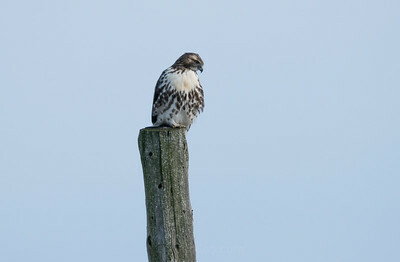 Most Hawks I've found love open grass or farm lands and like to perch on hydro poles. I've found a few Eagles, but haven't had much luck getting close enough to get decent shots of them, but they tend to like watery areas near forests, such as the Great Lakes shorelines. Many diurnal birds of prey like to perch on forest edges and overlook grass lands and bodies of water. It isn't very common (in my experience) to find them deep into forested areas. There's also a key point to remember about some species being diurnal-nocturnal dietary counterparts. 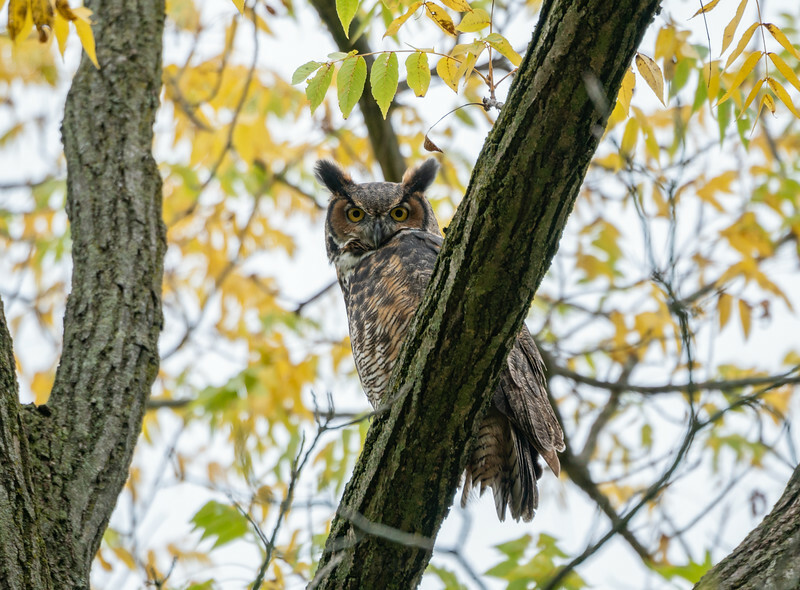 It isn't always exact, but you may find Great Horned Owls in a similar region that you'd find Red Tailed Hawks because they share the same prey. 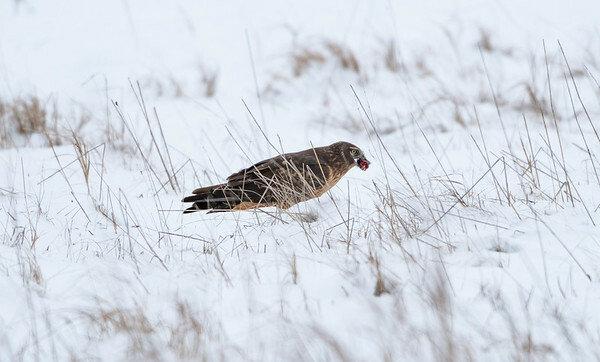 The Hawks will hunt during the day, and the Owls will hunt at night: sharing the same area. It is something to be aware of. Additionally, in many instances, other birds will tip you off as to where a roosting Owl is. Many people I've talked to have told me that this mobbing behavior is the most common way they've found Owls during the day, but I've only seen it once myself. 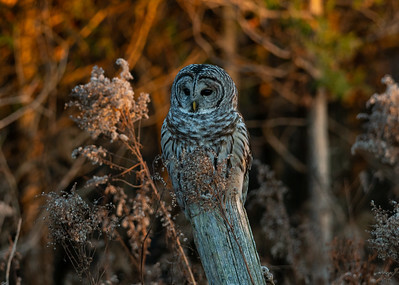 Blue Jays, Chickadees, or smaller birds, will mob (surround and chirp repeatedly) at an Owl in an attempt to get them to leave the area. When looking at the area they are mobbing, you may find the reason why. 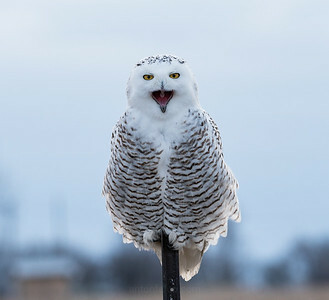 Finally, during mating season (December to Spring), Owls will call a lot more frequently close to, or after nightfall. Even at night, if you live near a forested area or fields, you may hear birds of prey call out for mates. At the very moment I am typing this (mid January), I can hear a Great Horned Owl in the distance somewhere in the forest behind my property. At the minimum, you know they are in the area when they do this, so you can try your luck seeking them out. 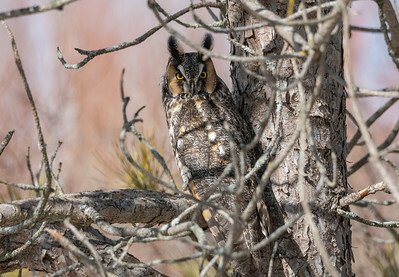 Additionally, with no leaves on the trees, they are a lot easier to spot when perched; especially the larger Owls (such as the Great Horned). Winter and Spring are definitely the easiest (and I still use that term very loosely) seasons to attempt to locate Owls. A key point of note here: If you find a nest, keep your distance and don't disturb the birds. 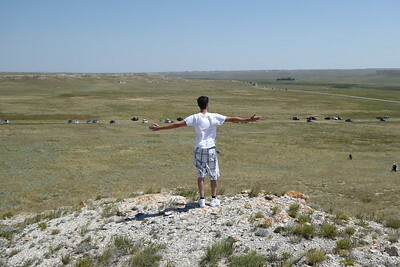 Take shots from a distance and try not to visit the area too frequently. Your close presence may lead to the bird abandoning the nest. No one wants that. In general, especially involving Owls, a lot comes down to luck: being in the right place at the right time, and also hoping you manage to find the one bird that doesn't mind you being somewhat close by and taking some pictures. 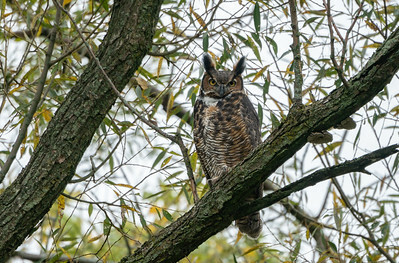 In an example picture below, I once found a Great Horned Owl perching on a branch above a very popular trail. Lots of people walking by, snapping pictures, and it didn't care at all. It didn't even flinch. Nearly all Great Horned Owls I've encounter otherwise haven't been the same and take off at the slightest hint of uncertainty. 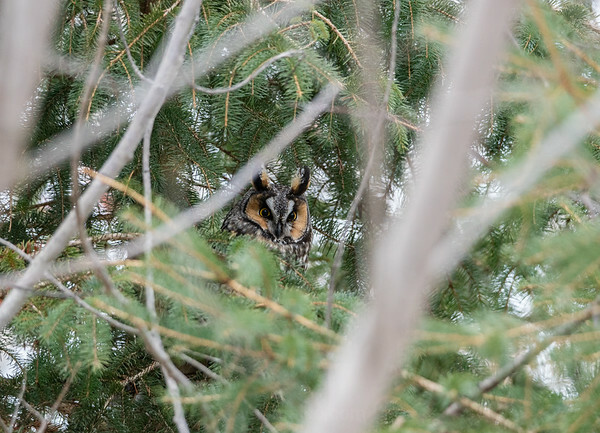 I've found several Owls over the years that I couldn't get pictures of with my non-telephoto lenses because they'd take off at the slightest hint of humans approaching them. Even when I know a general area where an Owl is, most hikes end with me getting decent, but not great shots. It's a game of numbers; the more you are out, the more chances you'll likely get. You'll also want to take your hike slowly when going through wooded trails and try to minimize noise. I've accidentally flushed birds of prey while walking on trails because I simply wasn't aware that they were there until they deemed me too close. Taking a slower pace allows you to, ideally, have a better shot at spotting the birds for a picture before they fly away, or you can move around them to keep them there relatively undisturbed. 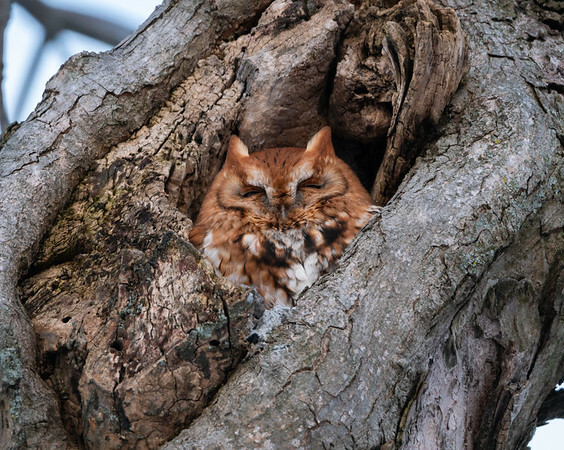 For Owls that like to stay in one spot, such as Screech Owls, they'll like to sit in hollow trees and may appear to sun bathe if the sun is hitting the hole (a south facing hole in the tree). They'll usually be still, so they don't present a difficult challenge to photograph, but finding them is a different story. 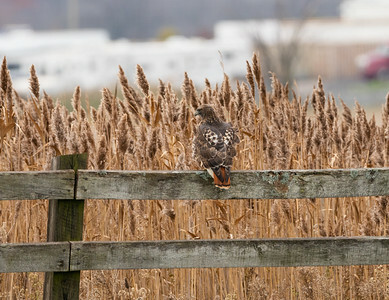 I will add additional tips and pictures to this ongoing blog as I encounter more birds of prey. I had a decent length lens prior to getting my telephoto, but compared to the shots I can get now, those images look rather lackluster.